Eddy current testing (ECT) is the best NDT method for inspection of non-ferrous tubing, period. Eddy current can detect and size defects affecting tubing such as steam erosion, baffle cuts, pitting, and cracking. Furthermore, ECT is a proficient NDT method for detection of defects under support plates. Internal Rotary Inspection System (IRIS) w/ Eddyfi relies on a transducer to generate an electronic pulse oriented parallel to the axis of the tube (flooded with water beforehand). The advantage of IRIS eddy current is its suitability for ferrous or non-ferrous materials. IRIS detects corrosion, pitting, and thinning on a wide range of tube diameters, wall thicknesses, and materials themselves. The only potential downside to this method is the necessity of the part being flooded with water. Remote field testing (RFT) w/ Eddyfi is an excellent method for inspection of ferrous tubing. RFT eddy current has an equal sensitivity to ID and OD indications and can detect/size defects just like conventional eddy current testing. The main difference between conventional eddy current and RFT is RFT’s suitability for carbon steel, such as: SA-179, SA-124, boiler tubes, ferritic stainless steel, nickel, and other ferromagnetic materials; while eddy current testing is only suitable for inspection of non-ferrous counterparts. probes with increased sensitivity to heat treat variances. Near-field testing (NFT) with Eddyfi is specifically designed to reliably test aluminum-finned carbon steel tubes of overhead heat exchangers (coolers). There are oftentimes the most difficult pieces of equipment to inspect, but NFT eddy current is made for the job. Additionally, construction of the NFT array probe also allows the analyst to understand the morphology of the degradation, and characterize with precise measurements. This, in turn, reduces the chance of miscall events. Saving you considerable time and headache required when re-tests happen. Before pulsed eddy current (PEC), checking for Corrosion Under Insulation (CUI) required removal of insulation which is cost prohibitive and time-consuming. Additionally, conventional NDT methods were limited to single points of inspection, unlike PEC. Now, we have pulsed eddy current (the Lyft) by Eddyfi. This advanced NDT technique utilizes the principle of electromagnetic induction (which is not unlike conventional eddy current testing). 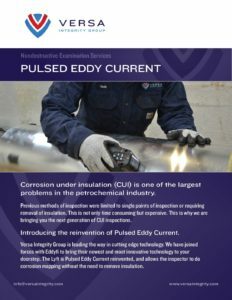 Distortions in the eddy current indicate a flaw in the material, and pulsed eddy current can detect these flaws through insulation (unlike conventional eddy current testing). PEC does this by measuring the electromagnetic response to several frequencies simultaneously; which ultimately allows the technician to gather information from a range of depths (hence the use of PEC to detect corrosion under insulation). cracking (HIC), and perform wind turbine inspection. Although eddy current is an advanced NDT service, many NDT providers offer it as part of their service suite. 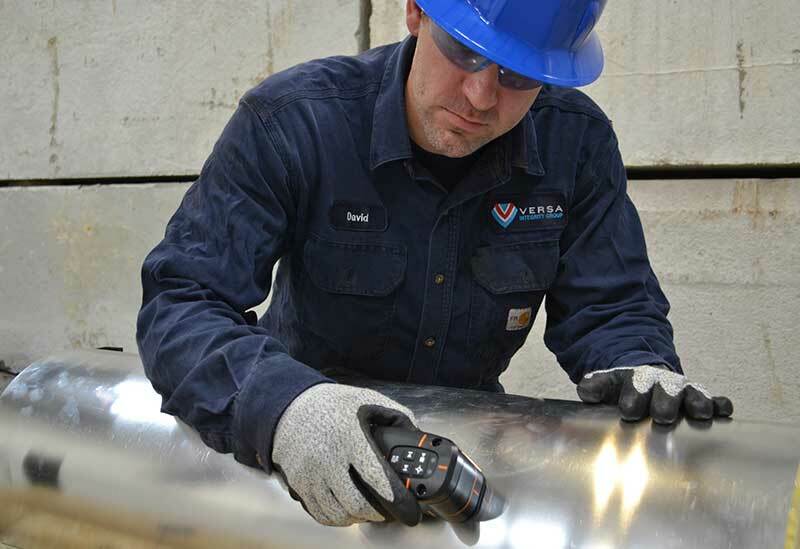 With that in mind, why would you choose Versa Integrity Group to manage your eddy current testing? Easy. We have the experience and technical know-how of all the above methods, so we can quickly determine whether conventional eddy current would work for your application, or if near-field testing (NFT) would be better suited. Finally, NDT is only one part of our comprehensive asset integrity management service suite. If you are searching for that sole source provider to handle your facility’s mechanical integrity, you just found it. We are the unified solution.